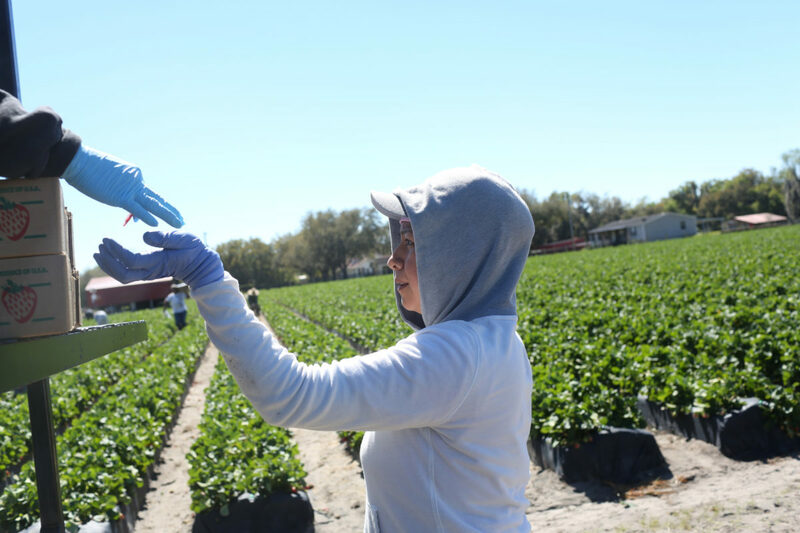 Maria Zuniga makes her way through a strawberry field with a full flat of strawberry containers ready to be brought back to the truck on March 4, 2015 in Plant City. Zuiga started her day before the sun came up and was already working in the fields as the sun rose over the surrounding palm trees. 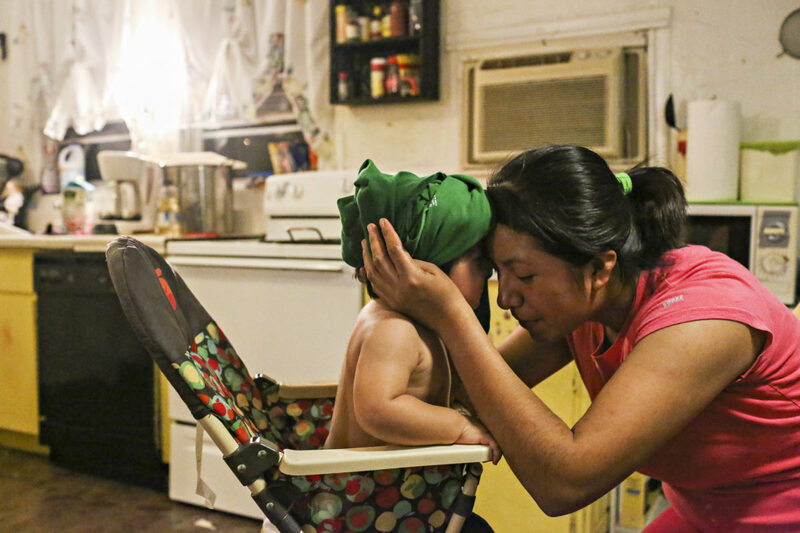 Maria Zuñiga embraces her son, Angel, in her hands in their kitchen in Plant City on January 22, 2015. Earlier in the month when Angel turned one, Maria and Jose threw Angel a large Baptism party using all of their savings account. Maria receives a token for bringing a pallet of strawberries to the truck. At the end of the day, she turns in all of her tokens for payment. 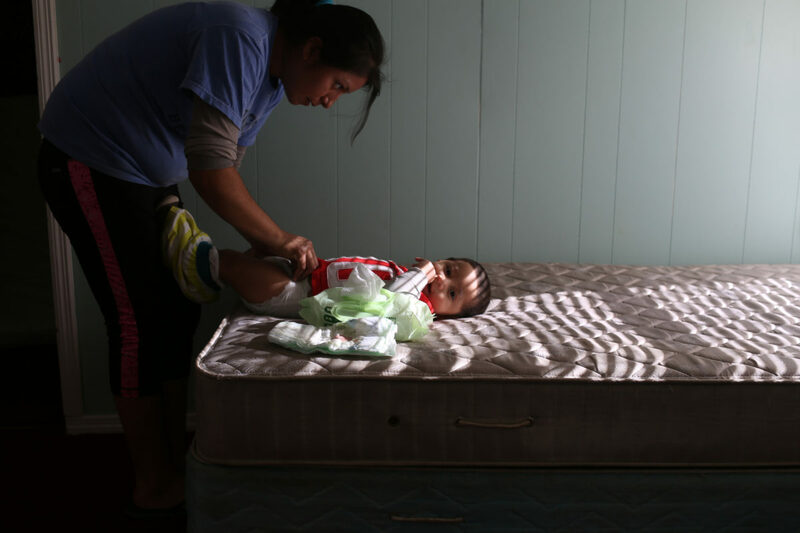 Maria Zuniga helps her son, Angel, stand on her bed in Plant City on February 20, 2015. Over the last few months, Maria and Jose have been working with Angel on being able to walk by himself. 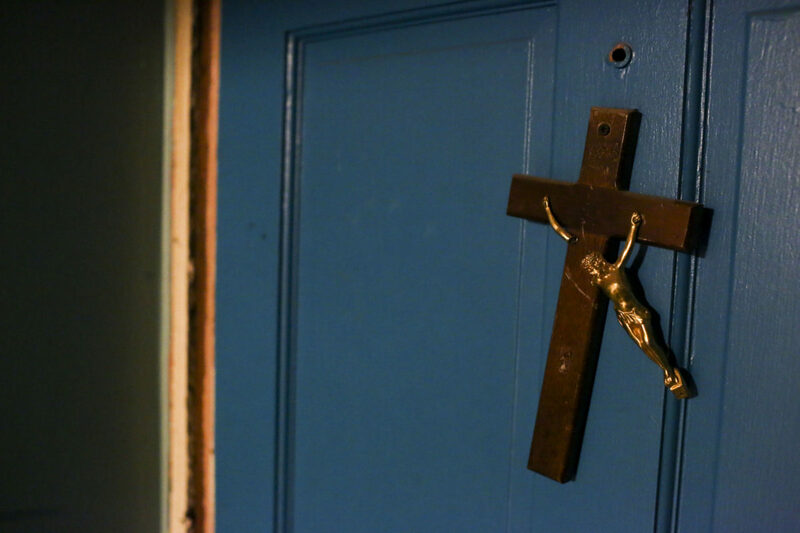 A broken cross on the inside of Maria's parents home in Winter Haven, Florida. 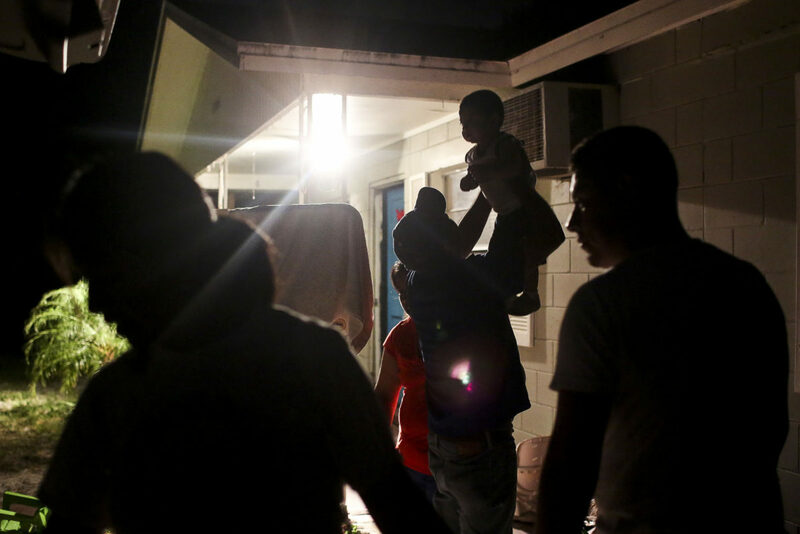 Maria's father lifts Angel into the air outside her parents home in Winter Haven. 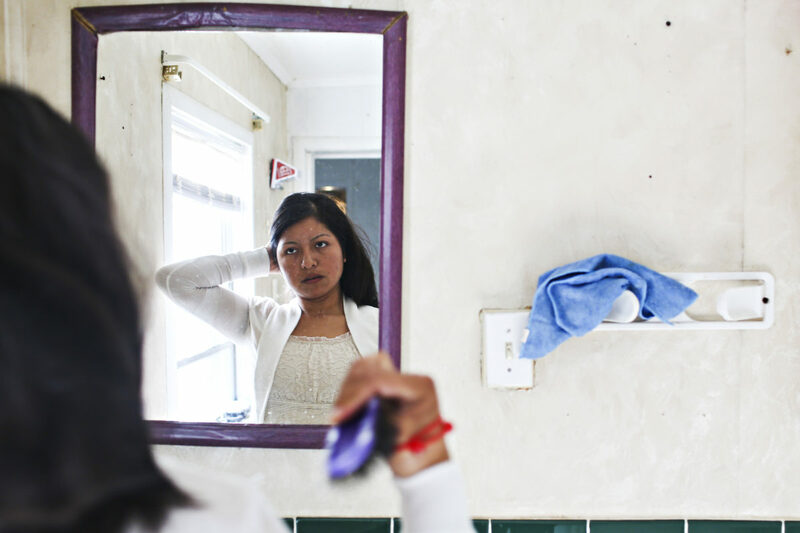 Maria Zuniga brushes her hair in the bathroom before running errands in Plant City on February 20, 2015. Zuniga wanted to become a nurse after graduating from high school, but it didn't happen. "With my parents working in agriculture, I didn't have enough money to pursue a career like that," Zuniga said. 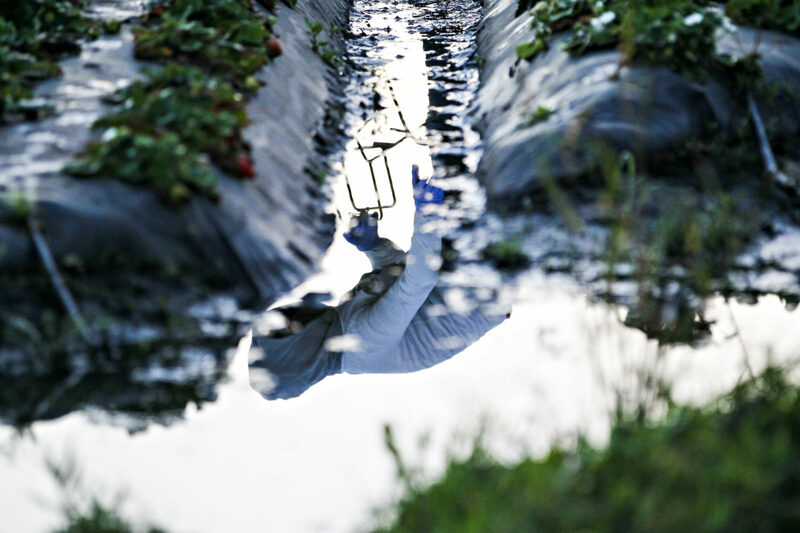 Maria Zuniga is reflected in a large puddle as she picks strawberries after a rainstorm in Plant City on March 4, 2015. The weather plays a huge role in how much money Maria earns week to week. 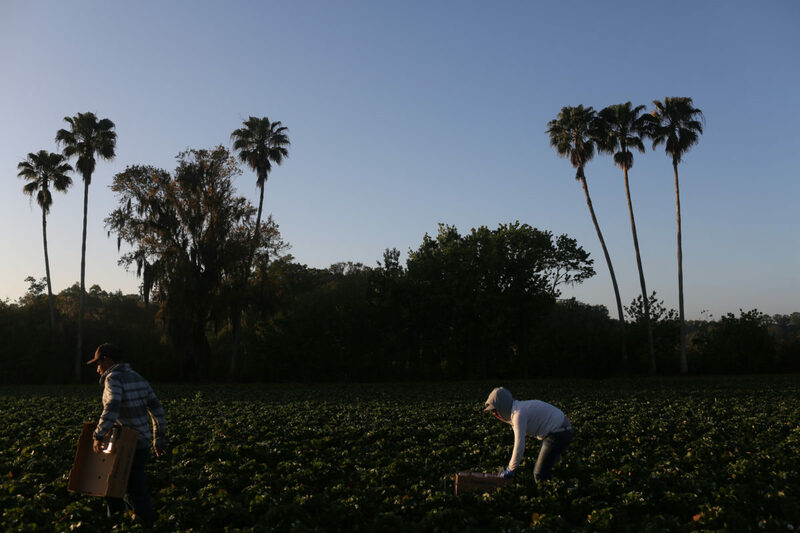 "...In February it's a little harder to earn money because the work doesn't pay as well, it's cold, and there aren't many berries," Zuniga said. 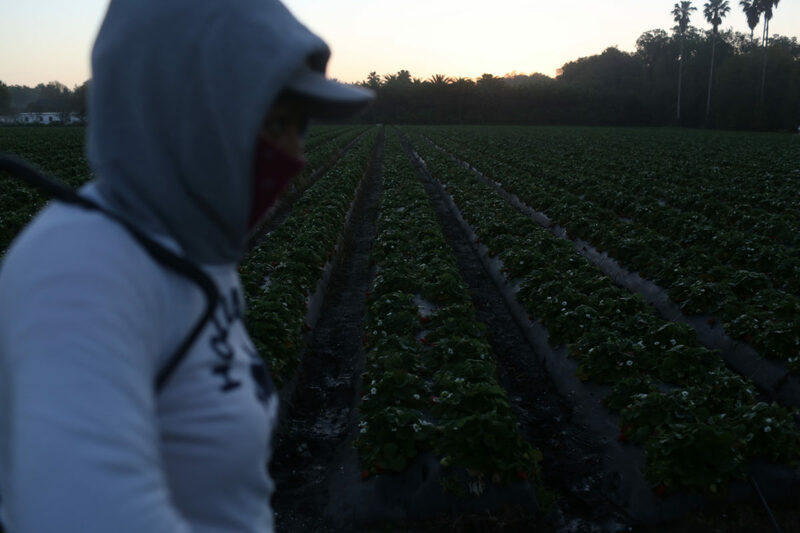 Maria walks past rows of strawberries as she walks to work from the parking lot in Plant City, Florida. 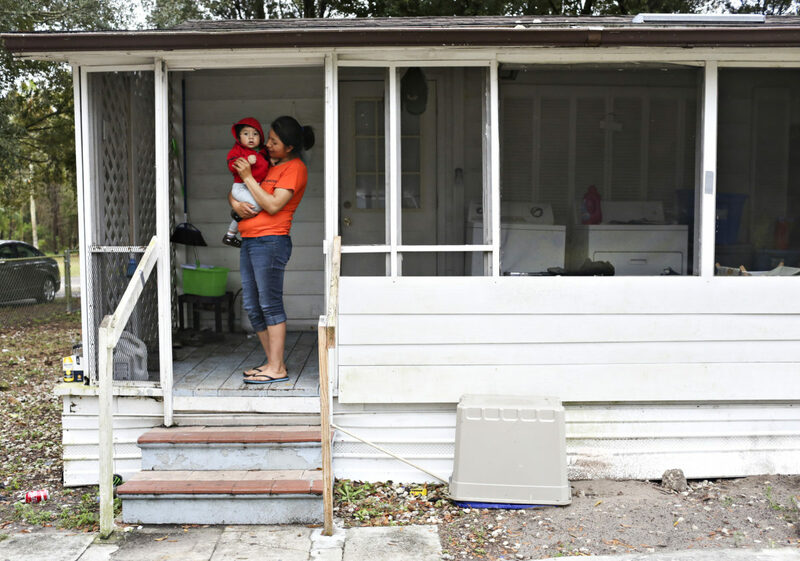 Maria Zuniga holds her son, Angel, outside of their home in Plant City on February 5, 2015. Zuniga lives in one of the houses the farmer provides to his laborers during their time in Florida. 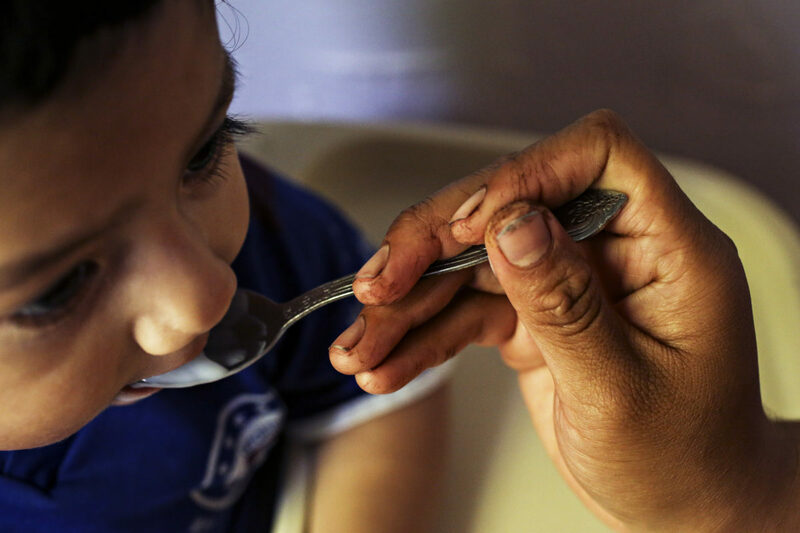 After spending the day working with her hands in the fields, Maria Zuniga comes home to feed her son Angel in Plant City on March 12, 2015. 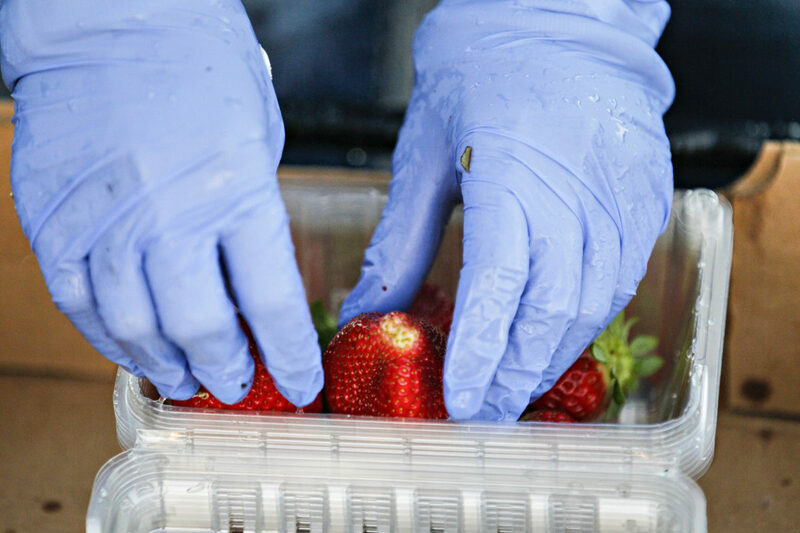 Maria Zuniga puts strawberries into a clamshell while working the strawberry fields in Plant City on March 4, 2015. The days of work in the fields are long for Zuniga. "ItÕs difficult. 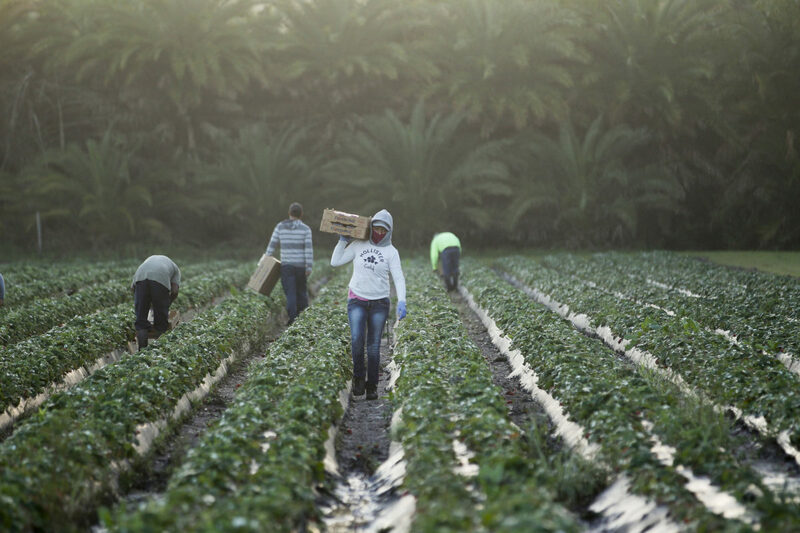 Because you have to stay bent over, or leaning, all day, from 7 a.m. until 3 or 4 p.m."
Jose passes Maria Zuniga in another row while working in the fields in Plant City on March 4, 2015. 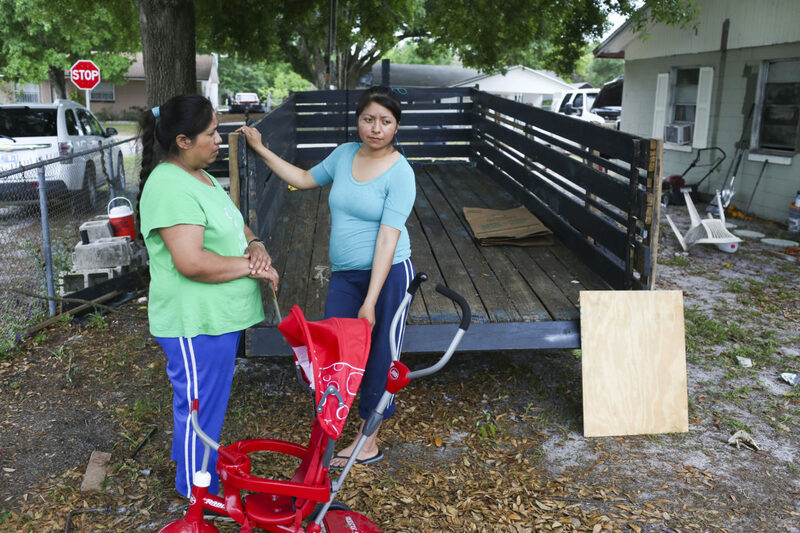 Maria Zuniga takes new clamshells and flats to bring back out into the fields in Plant City on March 4, 2015. Every time Maria turns in strawberries, she receives a token from another worker on the truck. These tokens are redeemable for between $1.50 and $3, depending on how much the farmer is paying. Maria stands with her mother in Winter Haven at her parents home after being forced to leave her home in Plant City after being fired fro her job in Plant City. Maria changes her son's diaper one last time in their old home in Plant City. 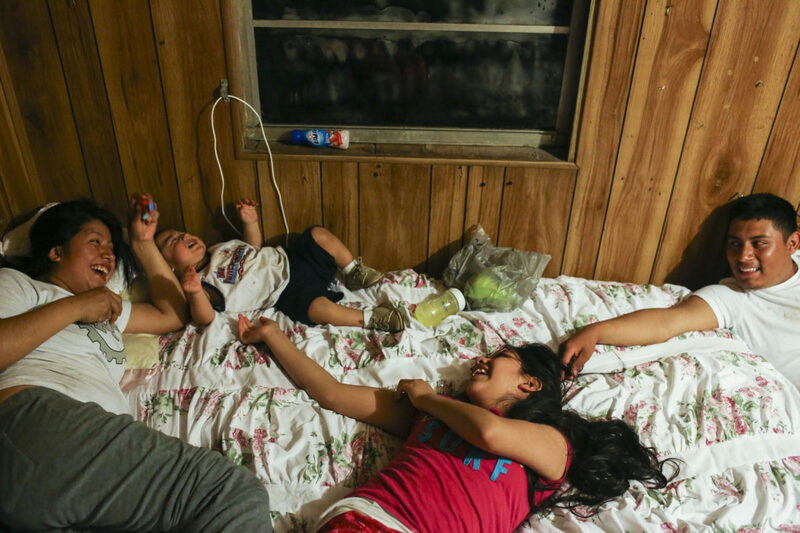 Maria laughs with her son Angel, sister and husband Jose while staying in their new bedroom in her parents home in Winter Haven. Maria Zuñiga had plans. 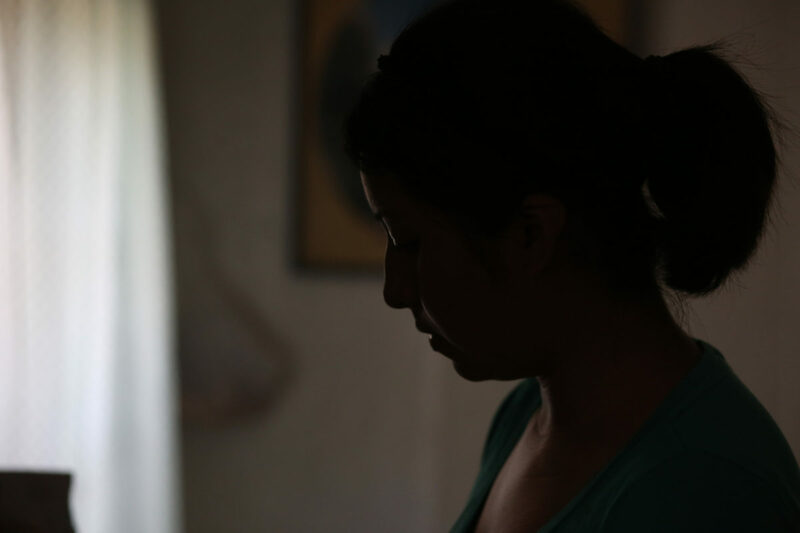 As a high school grad, she can stay in America, but her son’s father legally can’t. The uncertainty keeps her in the strawberry fields. In 2012, Maria became the first in her family to graduate from high school, a feat that qualified her for a federal program that grants legal protections to young undocumented immigrants known as Dreamers. Maria, Jose and their son Angel live between Michigan and Florida, following the apples and the strawberries crop from season to season. Maria often finds herself to be the youngest worker in the fields, going home to feed Angel with the dirt from the fields still clinging on under her nails. The weather plays a huge role in how much money Maria earns week to week. “…In February it’s a little harder to earn money because the work doesn’t pay as well. It’s cold, and there aren’t many berries,” Zuñiga said. 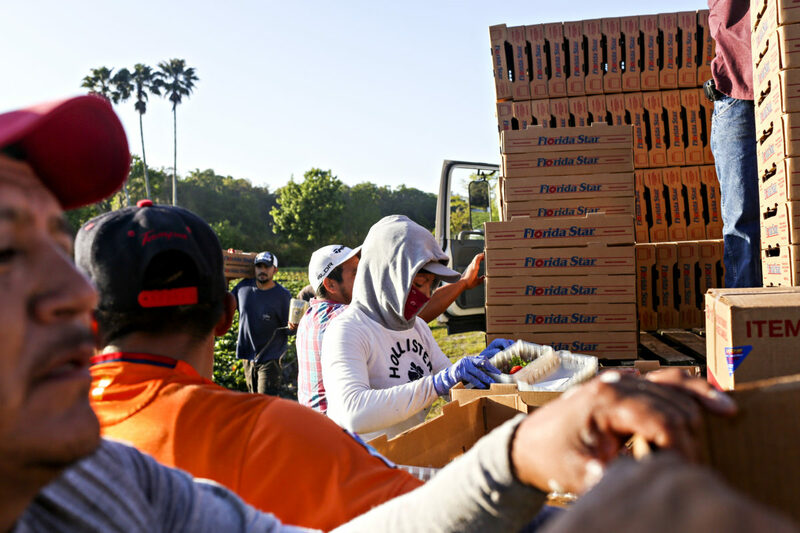 In eastern Hills­borough County, where strawberries are a billion-dollar crop and the local newspaper still features pictures of each year’s Strawberry Queen on its front page, there are 76 migrant camps permitted by the state Department of Health. 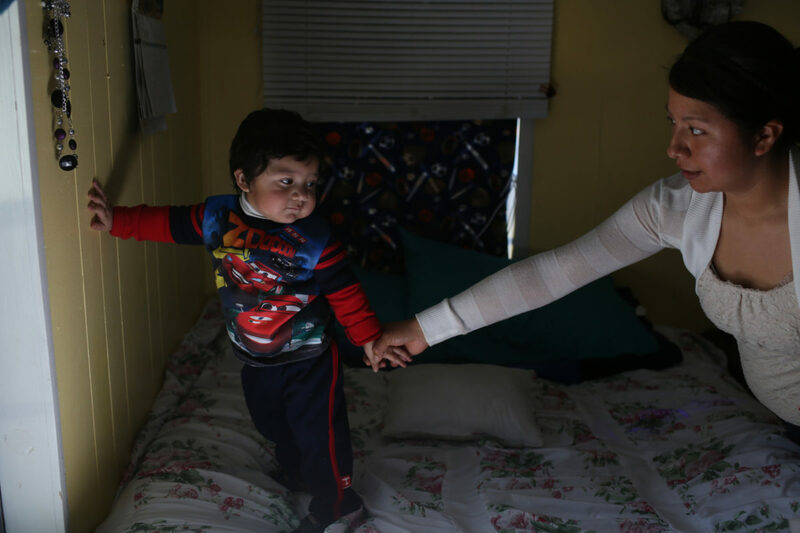 Maria, Jose and her son lived in a single bedroom home in one of these labor migrant camps. Maria’s home for half the year — a sagging, single-story wood-frame house, one of several owned by the farmer she works for — isn’t included in the county’s tally, and so neither is she. Haven, Florida living with her family as they continue to follow the next crop.